The Stand Up Sit Down Book Club meets the last Monday of every month at 7PM to discuss comedic literature and the memoirs of funny people. In September, we're reading Fraud by David Rakoff. Book club books are 10% off for those who attend the meeting! David Rakoff discusses Half Empty. David Rakoff reads from Half Empty. 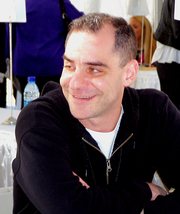 David Rakoff is currently considered a "single author." If one or more works are by a distinct, homonymous authors, go ahead and split the author. David Rakoff is composed of 4 names. You can examine and separate out names.